Six cups of dried soy beans. Wash, soak covered with water for 12 hours on very low heat, rinse, place in colander,3 liters of water in pressure cooker. Cook at 15 PSI for 2.5 hours. Drain and allow to cool to around 100F. Boil a pot of water to sterilize all tools as required. Be as clean as possible.I dip all utensils in the large pot of boiling water. Use the teeny Natto spore measuring spoon and take one scoop and dissolve with 1\2 cup of sterilized or bottled water at 100F. Pour over the beans in a sterilized pot and mix very well. Place half level about 1 inch of beans in the plastic containers. Cover with plastic wrap or sterilized cheese cloth. Install container tops. Place in dehydrator set at 100F. Allow to ferment for 24 hours. Check for the cobwebs. It should be done. Store in refrigerator for 24 hours then use as desired. 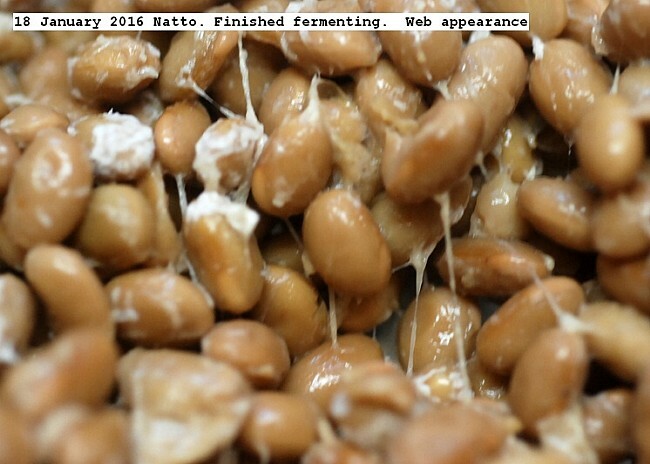 The Natto may be frozen and used at a later date. This entry was posted in Uncategorized and tagged Making Natto, Natto. Bookmark the permalink.